When it comes to fast food, America's got talent. 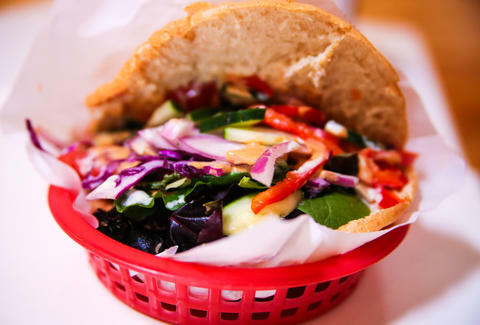 But despite our wealth of remarkable menu items, there's one wildly popular international street food that's yet to crack the American market: the doner kebab (also spelled "kebap"). To learn the history of the spitted meat that the rest of the world loves to swallow, we interviewed Michael Heyne, founder of the Austin-based, Berlin-style beef slinger Verts Kebap. By the end of 2014, Verts will have 17 locations in Texas, making them the second-largest doner chain in the entire world. Dude kinda knows his spitted meat. According to Heyne, Germany is the current kebab capital of the world and, with 17,000 kebab slingers in the country, is largely responsible for its global presence. But the origins of the food (which translates to "spinning meat" and is properly spelled with a 'P' due to Turkish phonetics) date back to the days of the Ottoman Empire. Instead of just kicking up their feet like their name suggests, Ottoman chefs changed the world of animal roasting by realizing that when meat was spitted horizontally, the fat dripped down into the fire, causing the flames to rise up and singe the meat. Turning the spit vertically kept flames in check and washed the meat in a tasty bath of fat. Sometime around 1870, the dish took its current ready-to-cut incarnation thanks to Iskender Efendi of Bursa. Bursa is the fourth-largest city in Turkey and the site of the Uludag mountains, which the Greeks originally referred to as Olympos but should not be confused with the mythical Mount Olympus, even if you consider kebab to be the food of the gods. The sliced meat gained popularity in Turkey, and, after World War II, a mass migration of Turks brought the food to Germany. Most folks agree that the first Berliner to put kebab in grilled bread was either Memhet Aygun in 1971 or Kadir Nurman in 1972, both of whom recently received glowing obituaries in British newspapers of record. So now that we're up to present day, it's finally time to address what the hell is going on with that upside-down pyramid of meat. As the meat spins, only the outer inch is actually cooked, leaving the inside layers frozen and uncontaminated. Those layers can weigh up to 200lbs, and are usually comprised of 95% veal, with a small chaser of lamb. During production, the meat is seasoned with spices like paprika and cumin, then soaked in a yogurt-based marinade to break down the cellular structure. Chicken kebabs came on the scene in the '90s due to the mad-cow scare, and white meat is now responsible for 40% of the €3bill German kebab industry. 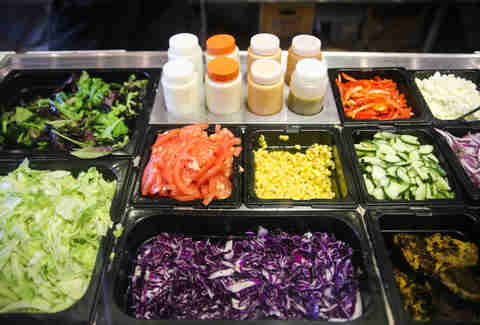 The country has more kebab stands than McDonald's or Burger Kings combined, but despite making up 50% of German fast-food joints, kebabs only bring in 25% of the total fast-food revenue. Hence nobody in Germany wanting to run more than one restaurant. Most kebabs in Germany are eaten with lettuce, tomato, cabbage, onion, and dill-yogurt sauce, but there are plenty of regional variations. Berliners serve it on larger bread cut into four corners and doused in spicy ketchup. 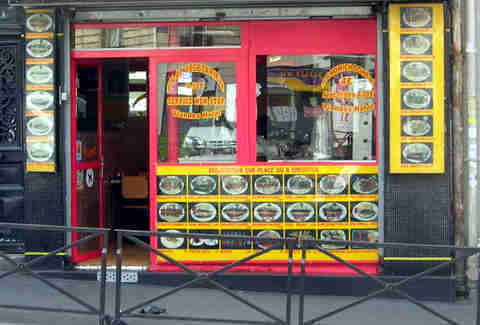 In Stuttgart, they spice them up with red pepper flakes and use circular, freshly-baked bread sliced opened like a pita. And in Hamburg, they use oval-shaped, panini-grilled bread. The rest of Europe is also full of kebby bappers, with the UK ranking #2 in sales (they use a curry sauce), followed by Spain (which adds falafel, French fries, or fried eggs), Italy (plus hot pepper relish, tzatziki, and harissa), and France (they're stuffed with chips). Turkey naturally has a few styles of their own, including Pilav Ustu (over pilaf rice flavored with fat) and the OG Iskender (topped with boiling butter!). Much of the Middle East serves the kebab under the name shawarma. 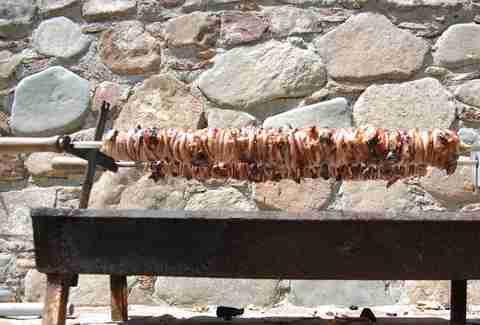 Greeks call it gyro (pronunciation right here), and preferred cheaper pork, instead of beef, long before austerity required it. 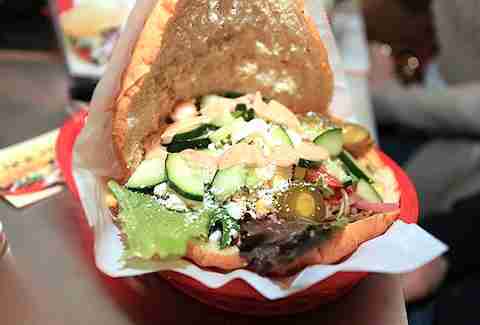 Gyros tend to be more popular in the US, but despite the lack of major chains, most cities have a few Mom-and-Pop kebab joints, as well as plenty of street vendors dishing out late-night doners. So next time you bite into a tasty kebab, remember you wouldn't have that delicious meal if it weren't for the inventiveness of the Ottoman Empire, a few shrewd Turkish expats, and the hungry masses of Germany. Dan Gentile is a staff writer on Thrillist's national food and drink team. Few things give him the same sense of calm as the slow spinning of vertically-spitted meat. Follow him to feelings of beef/lamb zen at @Dannosphere.